The upper floor appear to have lost their ornamentation while, in fact, they are intact as designed. One of those Scottish-born businessmen was Adam Norrie who arrived in New York in 1820. Norrie joined the already-successful firm of Boorman & Johnston and amassed a substantial fortune. He was known not only for his brilliance in business; but for his generous philanthropies. In 1853 Norrie’s only son, Gordon, constructed a stately brownstone mansion at No. 377 Fifth Avenue. The exclusive tone of the block was evidenced by his next-door neighbor at No. 379—Commodore Cornelius Vanderbilt. Gordon and his wife, the former “Miss Lanfear of New Orleans,” had three daughters and two sons. In the 1880s sons A. Lanfear Norrie and Adam Gordon Norrie were both attending Columbia College. One by one the children would marry—each wedding a socially prominent event—leaving their parents alone in the Fifth Avenue mansion with their servants. The first decade of the 20th century saw the Norrie’s neighborhood drastically changed. Two blocks to the south the Astor mansions had been replaced with the Waldorf-Astoria Hotel. 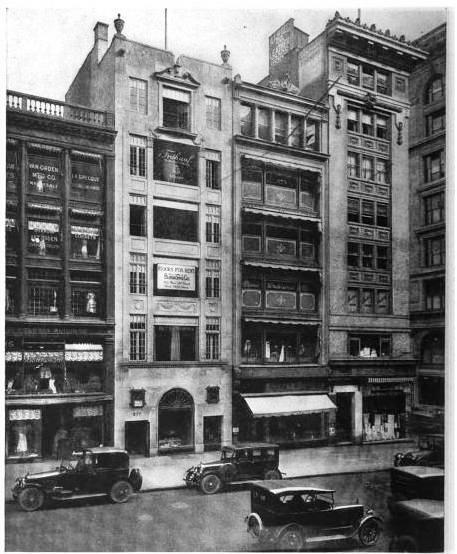 Just steps away from the Norrie mansion the massive B. Altman & Co. department store stood at the corner of Fifth Avenue and 35th Street. Before long Norrie’s widow left the house and it was gently converted for business purposes. When the shop of Crocker, “Mourning Specialty House,” next door at No. 375 was damaged by fire in 1917, the firm moved into No. 377. The specialized store sold mourning apparel and related accessories—so important in the Edwardian era. Before long the Duryea War Relief office would have to find other accommodations. Two months earlier, on June 25, 1919, gossip circulated that Emily L. Norrie had sold the former family home. “According to one rumor a large retail concern has bought the building and intends to alter the structure for its exclusive occupancy,” reported The Sun. Rather than erect a new building, the firm commissioned the architectural firm of Severance & Van Alen to convert the brownstone mansion into a modern commercial building. Completed within 10 months, the limestone-faced restaurant and office building revealed no hint of its former life. The Childs Restaurant chain was as well known for its architecture as for its food. William Van Alen (best remembered for his designing of the Chrysler Building) designed at least two structures for Childs. The completed No. 377 was so restrained in its ornamentation that it appeared nearly unfinished. There was no cornice and the tall base was severely planar. A sixth floor opening was ornamented with a broken pediment and urn (echoing the two classic urns perched on the spartan parapet) and a French-styled Juliet balcony. Only the spandrels of the second floor, with delicate festoons, were ornamented. The first tenant of the upper floors was Fruhauf Brothers & Co., a clothing manufacturer, which took the fifth floor. Henry Fruhauf was highly involved in local politics and interested in police work. Later, in July 1925, he would be appointed “Special Deputy Commissioner” by Police Commissioner Enright. Fruhauf’s name would be in the newspapers for another reason that year when he organized the “Five Cent Fare Club.” When Mayor John F. Hyland opposed a proposed hike in public transportation fares, the clothing merchant jumped into action. His “club” was actually a petition. He started with the names of his own employees, and by August 1925 had accumulated over 12,600 signatures. Childs remained in the first floor space for decades. The country’s entrance into World War II created changes in the lifestyles of Americans. Commodities like sugar, silk and gasoline were no longer as easily available. In 1942 the Government put a freeze on tin and, as a result, alloys became scarce in the private sector. On April 1, 1942 The New York Times reported that “Silver is taking the place of white metal in costume jewelry, it became evident yesterday." The alloy consisted of 90 per cent tin. The restriction caused the closing of tenant Leo Glass & Co. 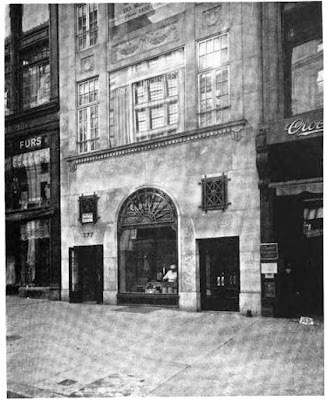 The Childs Company sold the building in 1945, moving its restaurant out after a quarter of a century. Throughout the remainder of the century the building saw a wide variety of tenants, many from the novelty and accessory industries. In the 1940s the Newark Glove Company, the showrooms of the Amber and Filflex Foundations, and the Valjean Pearl Corp showrooms were in the building. The 1950s saw No. 377 home to Handbag Fashions, and to Majestic Specialties, Inc., manufacturers of “handbag frames, compacts and parts.” And in 1966 Sportsmen’s Affiliates, Inc., offered life insurance for professional athletes in their 4th floor offices. The block of Fifth Avenue, once home to millionaires, still reflects the Edwardian changes. Severance & Van Alen’s elegant street level façade has been replaced with an uninteresting modern storefront. 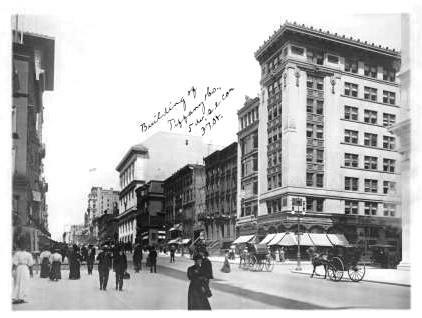 Where Fifth Avenue shoppers and businessmen stopped for lunch in the 1920s, tourists now pick through cheap t-shirts and souvenirs. The upper floors, however, remain essentially intact since the brownstone façade of Gordon Norrie’s home was stripped off and replaced with limestone.